I'm Blathering Now... (Tea, Tom & No Time to Blog! ): Birds, birds everywhere, but not a Cormoran(t) in sight! Birds, birds everywhere, but not a Cormoran(t) in sight! Holibobs! OK, it’s just a long weekend in Yorkshire, but it’s a break…and there’s a hot tub on the horizon. 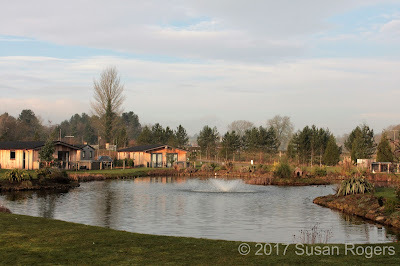 Over the years I’ve visited a few Hoseason’s lodges and they are a great place to wind down. The ones I go to are usually in a remote place where you can unwind and relax with a bottle of Prosecco, a book and a hot tub. There are usually places to walk and explore and they’re great if your idea of fun is peace and quiet! This winter (it’s always winter when I go, best time to go I think for hot tubs) I decided to try a new location. Cedar Retreats in West Tanfield is relatively new, about 4 years old, and near the Yorkshire Dales. As I was heading northwards, I thought I’d stop off at York for a little wander around The Shambles, a bite of lunch, and a quiet pint at the iconic King’s Head by the river. Iconic because it is prone to flooding, it even has a sign on the pub wall showing how high the water has risen! Thirst slated and onto West Tanfield, a lovely little village near Ripon. The welcome at Cedar Retreats was warm, and we were directed to our lodge. Now the brochure shows lodges surrounding a duck pond, but in the company’s defence, they do state that you need to advise them if you want a duck pond view. Our lodge was quiet and out of the way, and not overlooking the duck pond. As much as I love wildlife, three ducks started having a squabble about 11:30 at night, and it was then that I was relieved I wasn’t near the pond. I was trying to relax in the hot tub and I just wanted to hunt them out with a vat of orange sauce. That from a veggie…terrible!! Even worse, the next morning when I opened the patio doors, Mr and Mrs Duck decided they would join me for breakfast. I hadn’t made any plans with what to do with my time away, often my plans are weather dependent, so I just decided I would take each day as it came. 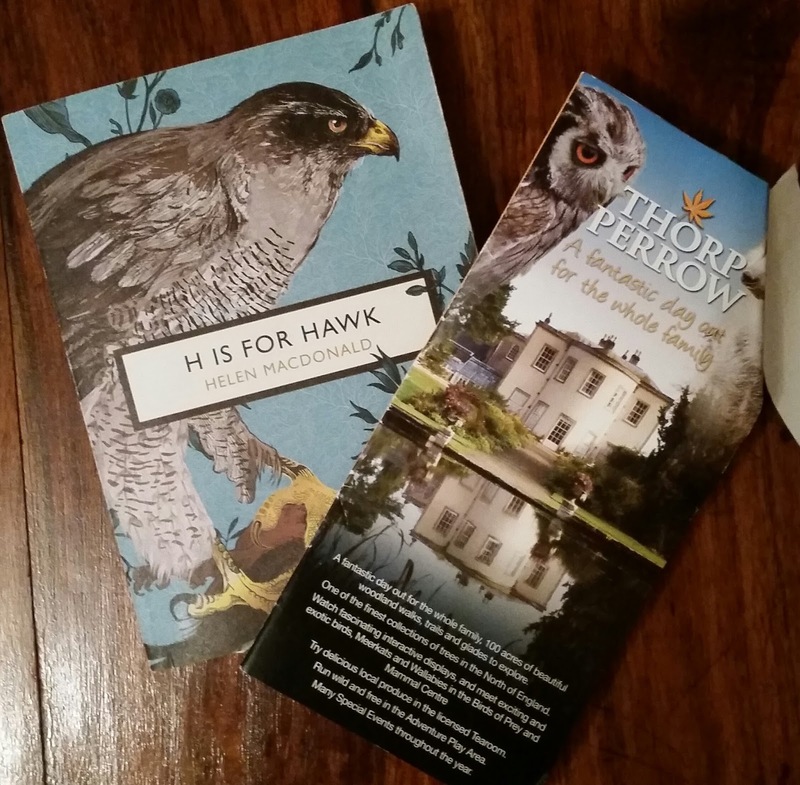 The hand book supplied in the lodge suggested a place called Thorp Perrow Arboretum for a good day out. The sun was shining, and I had just signed up to a digital photography course to learn how to take better photos and get the best out of my Canon EOS700D. A day shooting the springing snowdrops seemed a pleasant way to spend a sunny day. There is a bird of prey centre at the arboretum and seeing as I missed out on a planned visit to a bird of prey centre a few weeks ago because my cat was poorly, I thought I’d check this one out. A flying demonstration was due to take place, so I took a seat on a bench at the front of the display area and the head falconer Lindsey introduced us to three owls. She was so entertaining, informative and clearly had built up a wonderful relationship with the birds. She had them flying and sitting next to the people on the benches, and I just sat and held my breath as these owls sat next to me. I was enthralled. I had recently started reading H is for Hawk by Helen Macdonald and the magnificence of these birds was just starting to dawn on me. I hadn’t realised the connection that could be achieved by the falconer and the birds, it was pure poetry watching the trust between raptor and human. A further demonstration was to be held a couple of hours later with three different birds and so I wandered off for a cup of tea before coming back to witness George and Mildred, a couple of Crested Caracarra who were great entertainment value. By the time the birds had finished it was nearly 3pm; just enough time to slip down the road to Masham, home of the Black Sheep Brewery. The last time I was there, my friend had just got married and she held her reception there. I did the brewery tour, which I heartily recommend if you have the slightest interest in beer, and then I sampled some of Yorkshire’s finest ale. It was so good that several bottles of beer made their way home with me… together with a rather snazzy Riggwelter t-shirt! I hadn’t realised just how close Masham was to where I was staying, it was only about ten minutes away in the car. By the time I’d finished at the brewery it was too late to go into the village for a meander round, so the next morning I went for an early walk by the river in West Tanfield, and then after breakfast I set off to Masham to take a few photographs around the town square. Why? Well some of The Cormoran Strike series was filmed there, and I like seeing the differences between what you see on TV and what the real place is like. Normally I will go to places after I have seen them on screen, but as the opportunity was there I thought I should take it. Masham is still as pretty as I remember it from over ten years ago. I walked through the church the production crew had filmed at and the graves were carpeted in spring snowdrops. It really was peaceful. It was hard to imagine a film crew had been bustling around there only weeks before. At the back of the graveyard a gate leads across the fields and down to the river. I wandered down and followed the path round, fortunately, despite having no idea where I was going, it turned out to be a circuitous walk which eventually took me back to the village. All too soon it was time to think about heading home. I’d decided to go to Betty’s tearooms at Harlow Carr on the way home, but I didn’t want to get there until lunchtime, so I needed to find something to do for a few hours…and it was raining. Hard! The day had started out so well. I’d gone for an early morning walk to the local wetlands centre, but as I headed back for breakfast, the sky had taken on a foreboding, menacing look. A friend had suggested the Wensleydale Creamery in Hawes, which was technically in the wrong direction, but it would be a picturesque drive, whatever the weather! So, despite the views not being as far-reaching as I imagine they are on a bight sunny day, I ambled through the Dales to the home of Wensleydale (Wallace and Gromit's favourite cheese!) The museum is small and interesting, and I enjoyed watching the factory workers making cheese, but the best place is the tasting shop. There must have been about 15 cheeses to try, and try, and just to make sure before buying, to try again! Beer and cheese, a delightful way to spend the weekend, and there was still Betty’s to visit for Welsh rarebit, tea and cake.